Walt Disney World is famously known as the most magical place on Earth. Combine that with celebrating the greatest story of our generation, and you’ve topped every other perfect pairing. 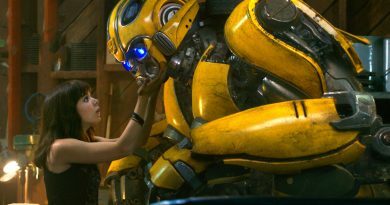 Peanut butter and jelly, strawberries and cream, milk and cookies – they all pale in comparison to Disney and Star Wars, at least in this fangirl’s estimation. Every year in late May and early June, Disney’s Hollywood Studios theme park in Orlando, Florida, hosts Star Wars Weekends. If you’ve been to one before, you understand what I’m talking about. For those who haven’t had the chance to experience it, or who are planning to go this summer for the first time, here are my five top reasons Disney’s event is a summer must-do for Star Wars fans. 1) Star Tours – Last year, George Lucas showed up on opening day of Star Wars Weekends to unveil the new and improved Star Tours ride. With the assistance of C-3PO and R2-D2, tourists aid the Rebel spy aboard their ship in evading the evil Empire. Between journeys to destinations such as Tatooine, Hoth, and Naboo, messages from characters including Yoda and Princess Leia deliver critical mission parameters. By the time the ride is over, passengers have experienced the rush of Podracing or the thrill of defeating the infamous bounty hunter Boba Fett. 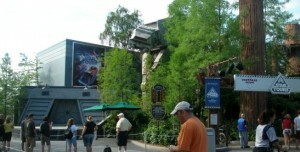 The new Star Tours has 54 different possible combinations, so each ride is a new Star Wars adventure. So far, I’ve seen 15 of the 54, and no duplications on the same day. Every ride, the conclusion never fails to bring whoops of joy and rounds of applause from the passengers. 2) Hyperspace Hoopla – What happens when you mash up Star Wars and pop music? Fun, dancing, and hilarity. This show used to be on a side stage; now, it’s standing room only even at the main stage under the Sorcerer’s Hat in the center of the park. And for good reason: it’s one of the most entertaining Disney extravaganzas ever produced. Words can’t do this show justice, so here’s a peek at last year’s version available on Youtube. TRICIA’S TIP: In previous years the show has started at 8:00 p.m., and the crowds start forming as early as an hour ahead of time. It’s summertime in Florida so wear your deodorant, hope everyone else does too, and bring water for the wait so you don’t have to lose your prime viewing spot. 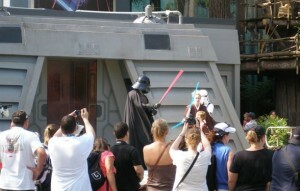 3) Jedi Training Academy – I believe every Star Wars fan should watch this stage show. Recruits don Padawan robes and learn from a wise Jedi Master about wielding a lightsaber, then a Sith Lord shows up and the Jedi have to face him down. Sure, the experience of participating is limited to the kids – at least the ones whose parents get them to the park early enough to enroll before all the spots fill up – but anyone who watches these Yoda-sized fanboys and fangirls as they determinedly duel with Darth Vader is suddenly transported back to their earliest experiences with Star Wars. 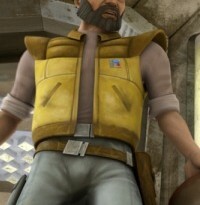 Do you remember believing that if Luke Skywalker could do the impossible, so could you? Every once in a while, a Jedi-in-training falls to the dark side and steals the show. 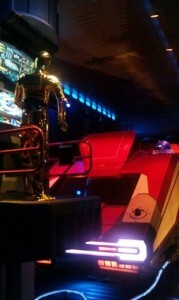 The Academy takes place a couple of times each hour on the Star Tours side stage. After enjoying the ride, make the time to stop by, enjoy the youthful enthusiasm, and remember what it meant be young and inspired. TRICIA’S TIP: I’m not joking when I say arrive early if you want to make sure your child will have a chance to participate. The earlier time slots are better with the Florida weather, and spots fill up fast. Get to the park before it opens, then join the line up on Main Street when they start letting people inside. When they drop the rope, grab (pick up) your kids and hurry straight to the signup location. Use of Jedi mind tricks and Force shoves will be penalized by the all-knowing Yoda who oversees the training. 4) The Hosts: James Arnold Taylor and Ashley Eckstein – The voice talent behind Obi-Wan Kenobi and Ahsoka Tano on The Clone Wars are back again this year. 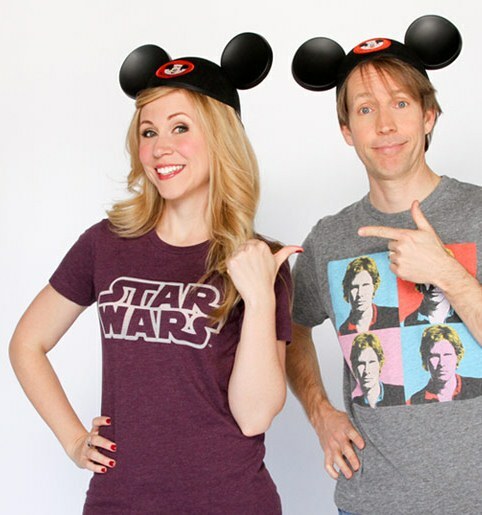 Both actors host a variety of events throughout the day, including a sneak peek trailer for Season Five, and they always manage to capture the Disney spirit. James Arnold Taylor premiered his one-man show last year, performing an amazing spectrum of voices while weaving an inspirational tale of his life as a voice actor. His show last year literally left me believing I could achieve my lifelong dream of writing my own novel. It’s an experience that shouldn’t be missed. TRICIA’S TIP: The lines for the hosts’ and celebrity guests’ stage appearances usually start forming about 30-40 minutes beforehand. If you’re only at the park for one day, I highly recommend the shows over rides as they offer unique insights into Star Wars (and are air-conditioned). I haven’t seen a guest turned away, but don’t be late. Once the doors are closed at show time, they generally don’t let people inside. 5) Star Wars VIPs – Throughout each day, Star Wars celebrities mingle with fans, sign autographs, and participate in Q&A appearances. Some of my past favorites are back this summer. Last year Ray Park (Darth Maul) took on the daunting prospect of teaching an entire stage of children a series of martial arts poses, complete with flailing lightsabers. 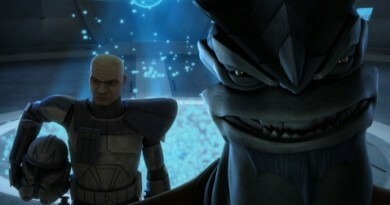 Dee Bradley Baker joined Ashley and James in hilarious extemporaneous voice-overs to The Clone Wars scenes in non-Star Wars character voices. StarWars.com has a full list of special guests if you’re hoping to see someone in particular. 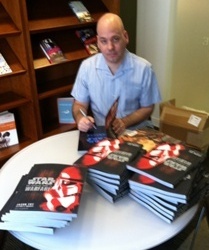 After you get your book signed, grab Erich and chat Star Wars. 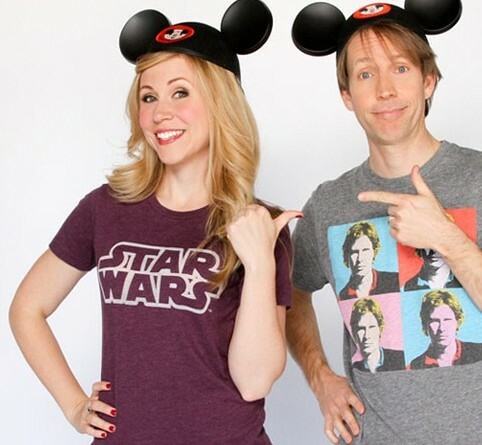 TRICIA’S TIP: Jason, Erich, and Cat are all great ambassadors for Star Wars, and they’re fans just like us. I plan to attend several of the Star Wars Weekends this summer, and I’ll be running around the park capturing the fan fun for FANgirl Blog, including some pictures of the book signing with Jason and Erich. Hopefully I can catch up with Cat, get her to pose with a purple lightsaber – Mace Windu wasn’t the first character to slice bad guys with a violet blade – and then start the campaign for more Star Wars television shows, preferably with Jaina. A fangirl can dream. Cat, Jason, and Erich were good sports and answered a little quiz I created to predict a fan’s ideal Star Tours ride. Befitting their artistic careers and their enthusiasm for Star Wars, all three of them gave answers that weren’t among the options I’d given. I have to say I’m most impressed with their fannish creativity. To see what their best potential Star Tours combination might be – or if you want to take the quiz yourself – click over to the next post. Good preview, but you should mention that Star Tours and the Jedi Training Academy are open year round, while the other events are just for Star Wars Weekends.